This morning, seventy-six thousand learners will not go to kindy or school. No, it is not another statistic about disengagement but one that is a result of the Christchurch earthquake of last Tuesday which inflicted major damage to about 34 schools. Add to that the thousands of university students and students in other education providers and the figures are huge. This probably also affects more than 5,000 workers in education – teachers, support staff, administrators across a wide range of activities. Another one thousand words on this grim subject is unlikely to ease the hurt and the suffering and the loss but there has been little said about the schools, the teachers and support staff, and the students who all rather remarkably appear to have avoided serious injury and death despite the physical battering that was visited on their buildings. The fate of the students in the language school in the CTV building seems sealed and it is likely that staff associated with them are also victims. But the absence of deaths or serious injuries among the schools that have been damaged points to some pretty smart work on emergency procedures, on safe behaviours during such an event by a group of teachers and other staff that have got it all right. The whole of education salutes this. The Ministry of Education has it seems been responding well and their response to the emergency is a huge exercise in logistics. Re-housing the students from schools that might not open soon is a huge undertaking. I know that at least one school had not re-opened after the first earthquake last September. Could we take a lesson from the evacuation of children from London during the war. Could senior students be “adopted” by schools in the north or well outside the danger zone for a couple of weeks? They might be matched up with a student at the host school and be billeted with them. I think this might work but only with the older senior students. The little ones need to be near their carers. The schools will get back to a different normal one day. I have seen schools damaged to the point of complete disappearance in cyclones through the Pacific and have always been amazed at the speed of recovery. I recall one in Samoa that opened for business on a Monday despite having been literally taken, both buildings and land, from the face of the earth by the cyclone on the previous Friday. The classes were distributed around the houses and fale in the village and while without resources that teachers worked to bring a pattern of school into the lives of their little ones. It seems that the many schools affected in the Queensland floods are now back in business but that was again a disaster of a different order. Buildings were damaged but not generally destroyed. When the water went away life returned quite quickly to a normal pattern in the schools I am told. But the earthquake is quite a bit more comprehensive in its impact and the damage is widespread. The roads to get to school are difficult and in places impassable. Many homes of teachers, staff and students have been damaged and undoubtedly many destroyed. There have been many deaths and teachers and students will be unable to avoid an impact on their lives through the loss of a family member or a friend or someone they knew. Normal will be very sad. The response of the university students in Christchurch has been remarkable. Getting into the physical work or clearing streets and properties and generally being busy, normal people around those who are having to cope is probably the best response possible. That it was organised by the students themselves and that word of it was spread virally is something of a good news story in amongst the unrelieved grim and upsetting accounts that have prevailed. Many of these students will have been affected by damage to homes, injurious and even death among wider families and acquaintances but their response has been practical, good humoured and, if the television pictures give a true account, they have set about the task with a smile. It must have helped hugely. How could we help our colleagues in education in Christchurch? Money is probably the best help because it can be converted into whatever seems best help by those close to the damage and those who have the best idea of the needs at this particular time. Perhaps all education institutions outside of Christchurch could donate 0.5% of their operating budget into a trust fund that can be used to supplement the assistance the Ministry of Education will provide. It might even be achieved by a voluntarily imposed levy – is this not a response that the Boards Association, principals’ and teachers’ organisations could get together and promote? But then you might have to pause and think about the fire at the Glendowie Primary School that recently inflicted huge loss on that school. Disaster comes in both small and large sizes but from a student’s perspective the scale doesn’t apply. The Christchurch Earthquake does seem to call for a response from the education community that goes well beyond our normal expectation that officials will put it right. Pathway-Ed: There's nothing as good as a good blend! Tea, coffee and whisky all put great store by the quality of the blend. Now it is educations turn to consider its blend. Blended learning, in which students are taught partially online and partially in a brick-and-mortar setting could serve to transform education but may face some potential pitfalls, a new report shows. The Innosight Institute report found that blended learning – that has increased potentially in recent years has the potential to meet individual student needs, provided the policymakers and administrators are open to innovative models. The report also calls for better content and more integrated systems to provide the online learning portion. I have wondered for a while whether blended delivery / blended learning could be a useful new pathway for students at all levels and especially in the secondary / tertiary interface. So I was interested to follow up the article in eSchool News warning that the benefits of blended learning might in fact be defeated by the intractability of the education institution with which it seeks to blended. It was based on a report written by Michael B Horn and Heather Staker for the Innosight Institute. Michael Horn is one of the authors of another interesting book which introduces us to the notion of the “disruptive innovation”. This theory invites us to accept that what is sometimes seen as a breakthrough improvement is in fact simply an innovation that disrupts the traditional pattern of prevailing practice by introducing a new practice. The net result of the ostensible change is in fact no change. This theory is interesting and rings bells for those frustrated by the lack or responsiveness of education institutions to the changing demands being made on them. It returns in many different ways to the basic theme that standardised approaches cannot hope to cater for the learning needs of a diverse student body. The report warns that blended learning might just be one of those changes that has the look of a significant change which masks the reality that the teaching remains the same (albeit through new and perhaps more exciting conduits) with result that are the same. I remember that back in the 1980’s computer technology was making in-roads into education. It was thought especially that it would enable education institutions to reach distant and remote learners and remove the tyranny of distance, especially in Australia. What in fact happened was that it was soon seen to be a useful addition to the array of techniques and aids for enhancing face-to-face teaching. Instead of the trek to the library to get into the queue for resources, many of the same resources that once were supplied on paper were now available through the courseware developed to support not new ways of teaching and learning but the conventional approaches. So teaching becomes a genuine partnership between the teacher and the learner and a bringing together of the face-to-face situation in which knowledge is both sought and given and the self-directed activity of the learner in which knowledge is to both sought and created, later to be tested against the work of others and the demands of a programme. And there is no one way of approaching this dynamic. Technology can be blended in a programme and never leave the classroom, it can be rotated as a method but will always be characterised by flexibility. Perhaps online laboratories or supplemental instruction is made available where the learner mixes the blend that suits them or it could be that teachers are only loosely involved in a programme conducted essentially by the students themselves but monitored closely. Blended learning seems to itself be a very flexible notion. Blend however is not the same as bland. But the key challenge facing blended learning is whether it will make a difference to the outcomes of education. Will there be increased success for learners who previously might not have succeeded or will it simply provide an additional option for those who are doing well already and in fact might do well in education systems regardless of the approaches taken by those who teach them. They are pedagogy-proof learners. Michael B Horn and his associates do not wish to see change that replicates current performance. Their notion of a “disruptive innovation” is where something is brought into an activity (in this case education) which runs the risk of being not as good as that which it replaces. Certainly I remember back in the 1980s how the early attempts to teach English with the help of computers mostly re-introduced the emphases and methods of the 1940s. Later in the 1990s distance / remote education through technology quickly became traditional instruction by screen. Blended delivery has great potential. The key measure of its success will never be measured by the technology itself but only by the extent to which it transforms programmes so as to better contribute to success – for the under-represented, the disadvantaged, those with diverse learning styles and those who cannot from the factory in which they work to the factory we call an education institute. That is probably why Christensen, Horn and Co called their book with delightful ambiguity, Disrupting Class: How Disruptive Innovation will change the way the world learns. Is blended delivery a new pathway to better educational outcomes in a diverse community? There are, we are told, 500 primary schools that are standing out from the Government’s requirement that they report to their community on National Standards. They disagree with the approach one assumes and believe that they can do as they please in this matter. Well in fact what he said was only that there were issues with the National Standards and that further work would be needed. It seemed to me that he was being entirely open about a major policy being rolled out across the country that relied on the large number of Principals and even larger number of teachers in a large number of schools for its implementation. This is a complex development and while many in New Zealand have great difficulty dealing with uncertainty, it is not possible to finish a development without starting it as they would seem to wish. You can’t finish a development before you start it as some would seem to wish. This results in pilot schemes, trials, reviews and a swill of consultation, the net result of which is usually the socialisation of a change into the ways things have always been done. It is not the issue of what a development does to schools but rather what schools do to a development. Change, if it is to happen, requires us to cope with uncertainty and to demonstrate a flexibility of thinking and a capacity to modify our actions in the interests of continuous improvement. There is no fixed state. My School 2.0 will be ready to be released from 4 March 2011. The expanded and updated version of the site will provide parents and the community with information about NAPLAN performance as well as information about school finances and school communities. To find out about the new features of My School version 2 click here. NAPLAN is the Australian National Assessment Programme for Literacy and Numeracy, a national testing programme. Now if some New Zealand schools would prefer to have tests arrive at the school in sealed envelopes which after having been sat and graded will be reported on in a web site that offers an easy technology for the comparison of schools – the X-box of League Tables – then I am surprised. If testing regimes brought about improvements in performance then why do they consistently and comprehensively fail in the USA? If the test approach works to lift reading and mathematics standards then why does the UK struggle? New Zealand has set out on an accountability regime that is different. It is a high trust model that says to schools that they have competence as professional for the teaching and assessment of learning and the evaluation of progress. Schools achieve this in many different ways. But let us have a consistent standard of reporting this to parents so that they can find out about their sons’ and daughters’ progress in a consistent manner that meets standards in reporting. Give me this approach over the test-driven one any day! The height of absurdity from those who oppose National Standards was reached when it was announced that Mary Chamberlain, who has led this development so well after having contributed significantly to the development of the curriculum, was leaving the Ministry of Education in order to spend increased time in Auckland where she lives. This was seen as an ideal opportunity to stop the development, to pause in its implementation, to have a rethink and so on. Time to have a cup of tea! Developments are never the work of one person and while the burden of leadership in them is a significant responsibility, a good development is not contingent on that one person. Ideas and principles will prevail, momentum will continue and life carries on. I worry that once again in the Education system we will carry into an election year some of the old tired arguments and the opposition to National Standards has now become one of those. The real issues that we should be seen to have commitment to tackle are to do with achievement and the long tail of educational failure that in terms of the international community to which we aspire to belong, is as long as it gets. The issue is the 20% who leave school before the legal school-leaving age and it is about those who stay in the system for little or no reward. Real issues deserve attention and the irony here is that for once the issues we should be tackling head on are the very same issues governments (for the awareness is now bipartisan in New Zealand) would also care to address. We should be working with them to develop a strategy, a plan and a way forward. This would be much more productive than carping on about National Standards. The mantra for education and especially senior secondary education and post-secondary education has to be “Get them in, keep them there and get them through.” Each part of the mantra has force and yet we concentrate significantly on the first part – getting them in. This is on my mind at this time of the year as many students are starting tertiary programmes for the first time and part of the process will be their setting out to see if it fits. Can I manage this programme? Am I prepared for it academically? Does it seem to fit? They will also ask rather more subtle but critical questions such as: Is this the area in which I really want to work? Do I want to go where this course is taking me? Do I want to spend part of my life doing this? Do I have the requisite level of comfort about what I am doing to really commit to it? Our tertiary institutions are much too inflexible and rigid on the matter of changing programmes. If a student makes a choice that turns out to be a wrong fit then they wear the consequences of that decision on their own. Once they reach the point where it is apparent they are in the wrong programme they are usually past the point where institutions tolerate transfers laterally into another programme. All we can offer to student is to suggest that they get off the bus and wait for another one which will be along at the beginning of next semester or next year with no refund on the ticket. Even after a year in longer programmes, tertiary providers are niggardly in giving credit that can be taken across to another programme. It is a case of Return to Go, Pay $200 (if only) and start again. Both these behaviours do not reflect well on our commitment to the mantra. Do we teach little or nothing that is usefully transferred to a new programme? If we do then transfer should not be an issue provided that we can be articulate and explicit about the skills and knowledge that is transferable. If we can’t then it puts paid to all that talk we hear about creating lifelong learners and preparing students for the future, for jobs that haven’t been yet been invented and other such claims. If our teaching has been effective then with a little bit of help, a student should be able to transfer and get into a work of another programme. There is also the force of the point at which students have the ability to withdraw (not transfer) without financial penalty. This has always been an official point at which students who have made their minds up about not wanting to continue or perhaps are starting to harbour doubts abandon their studies. Statistically this is a significant withdrawal point in the year in terms of students dropping out of tertiary education and training and yet it is entire an artificial creation of institutions. It is ironic that the only money-back guarantee we offer in tertiary education is the short period trial, full refund on withdrawal. This is more typical of the El Cheapo Infomercial world than it is of those selling quality products where customer guarantees are based on quality, length of durability and the sellers’ willingness to back their product. It might be better if students were not in this position and that is where issues of career guidance, course counselling and intensive student support are so important. In light of the patterns of disengagement from education and levels of failure in tertiary education, I am starting to be persuaded that the whole process of career guidance needs a shake up. Looking at education systems that enjoy higher levels of engagement and of success than we do, there seems to be a greater emphasis on students’ making some decisions about vocational direction by about the age of 12 years and having a clear direction established and acted on by about the age of 14 years. This does not mean the return of the 11+ examination or boys up chimneys at the age of 12 years; nor does it mean that employment becomes the sole focus of schooling. What this requires is an understanding and recognition that the subjects chosen and the levels of academic application demonstrated will have an impact on later choices. Life chances might in fact be reduced or increased by decisions being made from about that age. The flippant and informal choice of subjects on the basis of what friends are doing, which teacher is taking which class and perceptions of what seem to be easy options that will lead to effortless credit harvesting are an inadequate basis on which to build a platform for later success. But all this requires accurate information being delivered to students. There is growing evidence especially in the USA that students simply so not have access to enough information, to information that is accurate, or to information delivered at the right time and in forms that are able to be grasped by them. Surely this is easy to fix. As for student support in tertiary programmes, all the evidence says that support that is delivered before the need for it becomes an issue is more effective that that made available after the need is apparent. Support that is delivered at the start of a programme will lead to increased numbers of students staying in programmes and enjoying success. The challenge for tertiary education is to see that those who start the programme stay the course. “If you can read, thank a teacher” the bumper sticker says. I have just got through all the magazine reading that accumulated during the summer including an excellent article in the New Zealand Listener (20 January 2011, pp12-16). It was a compilation of contributions from famous New Zealanders about the “best advice I ever got.” On the face of it one might expect a success of clichés and sentimental homilies. But in fact there was one major surprise – many of the contributors credited a teacher with having given them their best advice or perhaps or advice about education from someone else. Roger Hall, the playwright, was urged by a girlfriend’s mother who, in his words, “sensed that I lack a direction. “’Why don’t you go to teachers college?” she said. I knew instantly that was what I would do, and it was the making of me.” A considerable number of our artists and writers got their start in a teachers college. Where else in tertiary education was there such a concerted emphasis on the development of the individual? But schools had also been influential to writers. Margaret Mahy goes right to a single teacher. “The best personal advice I remember came from my high school English teacher Ian McLean. He used to gallantly read the many stories I wrote and poems I wrote outside the constrictions of the school programme. Prime Minister John Key, speaking about his Mum and the resourcefulness with which she coped with the impact of events around the time of the Second World War, notes that “she started a new life, relying on her education, her determination and hope.” A good education might well be the best thing you can bank for tough times. The fact that few stayed in secondary school for five years is noted by Bob Jones. “Nearly 60 years ago I was a foundation pupil at Naenae College. It was pretty rough and ready, and by the time we got to the sixth form, only 10 of the original 200-styrong year group remained, everyone else having shot off to work in factories as soon as they turned 15.” Thois was very typical of secondary education back then with about 5% lasting the distance in typical suburban multicourse secondary schools. Jones then goes on to give a beautiful picture of and tribute to his history teacher, Guy Bliss. This is packed with points that teachers should note. Ordinary commonsense advice about asking questions still remembered after 60 years and the refusal to allow “relevance” to restrict the history class to a diet of simply what the syllabus dictated stand out. Sometimes it is an incident and the impact of advice that makes a lasting impression on young minds. Chef Annabel White retells a yarn: “Many years ago at Hamilton Girls’ High School there was a streaker (it was quite fashionable at that time). Ms Knaggs, the deputy principal, saw the young man running through the school. Instead of screaming shock horror she yelled ‘Go get him, girls!’ and the poor bloke, in panic, ended up caught up in the fence.” Turning a negative situation into a positive and empowering one was a key lesson for White on that day. There were a couple of others as well. But the influence of teachers and education in the lives of prominent New Zealanders is the tip of a huge iceberg of impact on all New Zealanders. Teachers and school are an important influence on people and the nation in which they live. Back in the 1950’s a young boy was approaching the end of his intermediate schooling and the move onto a secondary school was looming. Along with the rest of his mates he was given an enrolment form and instructed to take it home and fill it in. He did so with some help from his parents. He cannot recollect the conversation that night but the result was that he was enrolled in a technical high school to undertake a course in carpentry, one of the options in the technical course. He picks up his story……. 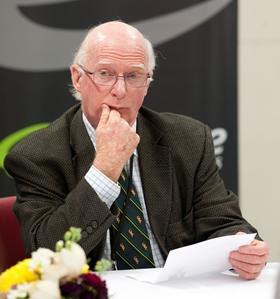 “In those days, the late 1950’s, New Zealand secondary schools were organised into stratified courses based on the split between what I now understand as academic and vocational. I also later came to understand that there was an undercurrent of perceived and even assessed ability that guided the advice given and the choices made. You were expected to enrol in a school and also into a course. I know now that “Academic” usually meant two languages and “General” one language. “Technical” was for the industrial arts with tracks through metal, wood and technical drawing and it was almost exclusively for the boys. The girls were directed into “Commercial” or “Home Economics”. This tracking approach was very much oriented to the role of the secondary school in providing the bridge between the basic education of the primary school and the special skills needed for employment. It was not by accident that secondary schools were more likely to be referred to as “post-primary” schools than they were to be called “secondary schools”. Going to secondary school was, and especially for my family, the next step in heading into a job. In fact I never got to the technical high school. My intermediate school principal intervened and told my parents that I should not be going to a technical high school and I should not be doing a course to be a carpenter. This advice puzzled, perhaps even troubled, my parents. My mother had been to that particular school a long time previously of course. My two brothers had been there and one had done the very same course that I was enrolled in. “Why?” she asked the intermediate principal. “Because he is academic and should be doing an academic course – that school doesn’t offer one,” she was told. This caused some consternation. No-one in our family had ever been called academic. We never thought of ourselves as academic. We had little or no understanding of just what that meant but we did appreciate that to get certain jobs you took different courses, that is why we had chosen technical. Perhaps even there was a feeling that all this academic business was a little above our station in life. Eventually it was agreed that I should undertake an academic course and therefore change the school in which I was enrolled. The intermediate school recommended the local boys school but this was declined on the grounds that I was too small. Fortunately a multicourse secondary school had recently opened and was offering the full range of programmes. I started off in Form 3 in a cohort of about 200 students organised into programmes – Academic, General, Technical (Boys), Commercial (Girls) and Home Sciences (Girls). Four years later at the beginning of my last year at high school, the beginning of what is now Form 7 (Year 13, Grade 12), the twelve survivors of this cohort were paraded as an example to the incoming third formers, of quite what I am not sure but it was probably an exhortation to work hard and to value education. In my second year at high school, they introduced a Form 4 Certificate so that “most students would receive some recognition of their post-primary education” – I still have it. A lot of my mates left school after that to go into jobs and a small band of us was left to undertake study at the senior level. Having little background in such work and receiving little guidance and help, it was a matter of survival by observation and experimentation. Failure was perilously close on many occasions. My level of preparation for work at the senior secondary level was simply inadequate in terms of my understanding what really was required. And how did this boy end up? He did OK. This story ends in the same way as the endings of so many stories played repeatedly on radio request sessions back then. . . . . . .
Hey, wait minute. For a number of years I have extolled the critical importance of early childhood education in terms of educational advancement and achievement. Two years of quality early childhood (i.e. 15 hours a week) would lead to such gains, I argued. This was on the evidence of research in the USA. There is widespread agreement with this internationally. A Labour MP in Britain is arguing at the moment that early education will improve later school performance. Well, I thought, that is because it is mathematics and there could be many explanations why there is no correlation between access to ECE and later performance in mathematics. The story would be very different, I thought, if we also included Literacy and Science. So I added them to the chart. Then, this type of reporting also ignores that coarse nature of such a statistic as participation. Take New Zealand as an example. We might feel quite proud of our 95% rate but this is not evenly apparent across the system. Historically, Maori and Pacific Islands children have had lower access to early childhood education while the waged white middle classes have had both easy access and high quality provision. This is a fact and a trend that successive governments have always grappled with and it was exacerbated by the removal, for instance, of the targeting of the 20 free hours provision. So let’s be impressed by Finland – only 44% participation The Spectator tells us but top of each category for achievement among the count rues in this survey (actually they did well in the whole PISA lists!). In Finland school starts at 7 years (but you can start at 6 years). About 75% of young ones in Finland have a significant exposure to day care and there is almost full enrolment in the pre-school classes at ages 6-7. Reports such as that in The Spectator do not grapple with other issues – the extent to which the ECE curriculum is related to that of primary schools and premised on the fact that ECE should be preparing students for primary school. They don’t focus on the extent to which staff in formal pre-school classes are qualified (Finland has 100% degree qualified many up to Masters level!). They don’t report of the size of the tale of educational disadvantage and failure in the respective countries. Finland has a short tale we have a very long tale. Stories such as this one in The Spectator start off by being political and never rise above the opportunity to take a few cheap shots. The key issue is to work towards quality early childhood provision for all students and perhaps a clearer distinction between day care and more formal ECE. I suspect that currently a disproportionate slice of the ECE resources are going to those whose focus is day care rather than ECE while those who might benefit from ECE are missing out. I have long thought that adding ECE to primary schools was a possible and desirable way forward. But even if it were the same old sector division would arm themselves for war and protect their territory. It is not only the secondary / tertiary divisions that stop us being internationally competitive! There are pockets in the community where access is very low indeed, perhaps as low as 40%. Whatever league tables we produce, this is a statistic that is intolerable in a developed, blessed and, in better times, rich country. This is the Silver Jubilee Year. No, not of some minor royal, the A and P Society or even a school. It is the Silver Jubilee Year of a PPTA paper written in 1986 that deals with the issue of what the writer of the paper, Phil Capper, called the “Jagged Edge. (Capper, P. (1986) Jagged Edge, NZPPTA H.X.86/229, Wellington). Let me quote a bit of it..
“This document is a discussion paper in which I attempt to bring together developments taking place in a number of areas which … present a challenge to the secondary education sector; and which underlies many of our [PPTA] policies. The developments that represented this threat at that time were curriculum reform, assessment reform, transition education, ACCESS, Link Programmes, Lifelong Learning, education outside the classroom, bicultural education and vocational education. Many will remember these developments with some nostalgia. This is prescient stuff. The message, twenty-five years ago, was abundantly clear in the paper: the senior secondary school was not meeting the needs of a all students. This is the issue we face today and then, just as now, there need be no doubt that this situation would be responded to one way or another and if schools didn’t respond then others would. But as I have noted previously, it is not what reforms do to schools but what schools do to reforms that matters and change, when it did come, was both slow and of relatively little impact. Twenty-five years ago, this PPTA paper grappled with a situation that still pertains today with one exception. This time alternatives to the conventional secondary school are appearing and schools are faced with issues (essentially those outlined by Capper back then) that arise from the need for schools to be flexible, to work with others and to see resources in terms of the student for whom they are provided rather than the school to which they are given. At this time, the developments are different but their impact on schools will be much the same if schools continue to exhibit the degree of unwavering commitment to the traditional patterns of schooling that Capper warns against. Even now such an analysis would be thought of as a little radical and yet time has only underlined the basic truth of its hard-hitting comment. Six years later, Capper returned to the topic (Capper, P. (19992) Jagged Edge Revisited: Part the First – The Secondary Tertiary Boundary, NZPPTA, HX 92/032) this time describing the issue as “questioning the continued validity of regarding the secondary service as a fixed and discrete entity” and a blurring of the boundaries between secondary education and other sectors which posed a challenge at that time to the policies being pursued by the teachers’ organisation. Issues that are not dealt with do not go away and even after twenty-five years will re-surface. In this instance, the issue that is captured by Capper has now become quite a focus throughout the English-speaking education systems but there is one key difference. There is this time a clear understanding of the demographic overlay that adds urgency and indeed inevitability that change must happen. Schools have not been idle; teachers have not simply turned their backs in order to ignore the issues. Much work has been done in developments such as NCEA and other qualifications, small concessions have been made with academies of one kind or another, and increasingly teachers are returning to professionally engage with the issue Capper highlighted – the appropriateness of current senior secondary schooling to a wide group of students in the face of developments of alternatives. It must also be remembered that Capper was writing in the late 1980s and early 1990s at a time when the trend of keeping students in secondary schools for five years was starting to make explicit the fact that there were at that time numbers of students in the senior secondary school that had never in the previous hundred years been there. The elongation of secondary education from two years to five years had rapidly happened in the period 1975 to 1990 with the 12% of students who had been staying at secondary school for five years increasing to 65%. The senior secondary school was now being asked to attempt something that it had never in our history achieved – i.e. provide a five year programme for a full cross-section of students. This was a major cause of disengagement from education. So the stakes in all this are much higher this time as we replay a consideration of the issues Capper raised. No response is not an option. The role of secondary schools will play in any response will depend in large measure on the flexibility that they welcome into the senior secondary school. A recent book from the USA has the title So Much Reform So little Change. This is now a luxury we cannot afford.